One of the most important and momentous occasions in any wedding jubilee is the rehearsal dinner. This pre-wedding gathering is more of a celebration than a traditional event, which is why you need to have the perfect rehearsal invitations to match. 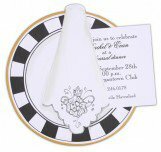 Whether you're searching for rehearsal brunch invitations or you are leaning toward more classic rehearsal dinner invitations, Polka Dot Design is here to help. We also have other wedding festivities covered, which makes us the ultimate one-stop-shop for all your invitation needs. Like our wedding shower invites, for example. Our personally curated collection of invitations range from elegant, contemporary cards to a more fun and festive variety. Perhaps you are looking for wedding shower invites that aren't of the traditional kind. We carry lingerie shower invitations, bridal tea shower invitations, and even couples wedding shower invitations. We have wedding invitations for every occasion which vary in style so you always come away satisfied as well as excited for the celebrations to come! Our wedding party invitations run the gamut of decor and design so that you'll always be able to find something to suit your needs. Here at Polka Dot Design, we want to take the guesswork out of the invitations process and handle the small stuff so you can focus on the rest. Here comes the bride? Not yet, first up is the Rehearsal Dinner. When all of the wedding planning starts to come to an end there is little we look forward to more than the night before dinner. It is a time to relax and gather with family and friends to soak up the bride and groom. The rehearsal dinner, as we know, is generally hosted by the groom's parents. Traditionally it is held promptly after all the wedding party runs through their part of the wedding ceremony. After all, we don't want to mess anything up on the big day. Practice does indeed make perfect. It also makes you hungry, so that is where the dinner comes in. What is fun about this event is that it doesn't have to fall in line with the theme of the wedding, in fact, it can be a departure. Some find this refreshing. Variety is the spice of life. When planning your dinner, make sure you ask the bride and groom what they have their heart set on. Most of the time, they won't care, they will just be grateful it is happening and that they don't have to plan it! That is where we come in. We will help you select the exact invitation to suit your event. You can start your night out at the location of the wedding ceremony and then move to the dinner spot. Think about a setting where everyone will be comfortable. Most of the time guest will be there from out of town, so make sure you include directions and very specific instructions to keep things easy. It's a great idea to have a time of reminiscing over the couple. A slideshow might be a great option, you can have photos in trios paired with flowers on the table. The bride and groom would be so touched to have a book of advice passed around. It is a fun gesture that can include sentiment and humor to get them through any moment in the marriage. The rehearsal dinner is also a time of symbolism. Often it may be the very first time both families have united as one. Having a family dinner as one unit signifies the beginning of a bond that will last the bride and groom's lifetime. It is the perfect moment to shine a light on their love. To show the couple support and provide a moment of pause. It is the last night they will be single as well, so why not dance and pull out the karaoke machine, it's the precise time to celebrate and cut loose. The most important ingredient is love. The rehearsal dinner invitation will set the tone for a memory of a lifetime. Start with something elegant, charming or playful. It really is up to you to set the tone. Keep in mind what the vibe of the family will be and what they will need most out of this night. Then host like a boss!